EK102 - Works best with J Strong EK106 Hard Top with Built in Stereo. EK117 - Works best with other tops or no top. Introducing the new Rhino folding windshield by J.Strong Industries. 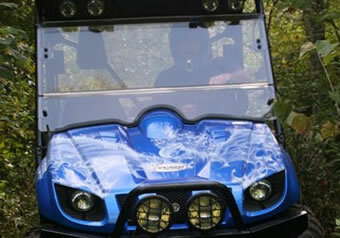 A new innovative folding windshield designed specifically for the Rhino. - The folding design allows for access to the cab for air ventilation on those hot summer days or ride with it up to protect you from dust and debris. 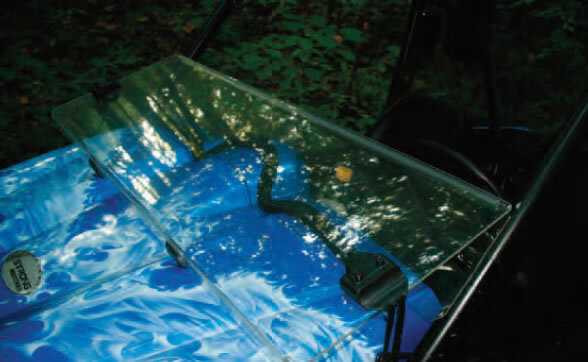 - The windshield is made of impact resistant acrylic to prevent dangerous shattering and potential injury. - The acrylic is non-yellowing, non-crazing as well as UV resistant. - Provides great protection from bugs, dust, rain and snow. The new windsheild fits and works great. It didn't come with any installation instructions. I had to go to J Strong's websight to get them. 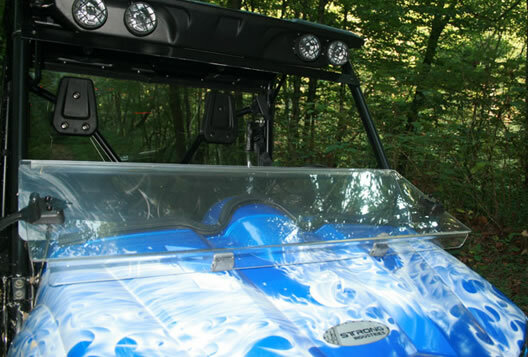 My J-Strong fold down windshield is awesome it is crystal clear and really makes my Rhino enjoyable to ride in cool weather!!!!! Great purchase.